Emotions tend to drive traders. Fear and greed are major market movers, with fear - the most base form of human emotion - overriding greed. That’s a core reason why markets usually drop faster than they rally. In order to become a successful trader, the correct mindset and psychology need to be developed and maintained, which is often easier said than done. Once we have got a handle on fear and greed, the next biggest challenge we have to face is ego. Ego can be defined as a person's sense of self-importance or self-esteem. In trading terms, this can be described as the desire to be proven right about the direction of the trade. Now, let’s get this perfectly clear, we all like to be right. Making the correct call on the market can elevate the image we have of ourselves and can provide us with a sense of self-worth and value. This was crucial back in the days of pure survival because we had to be of value to remain part of our tribe or community, and our inclusion was closely linked to the ability to survive. Ego has deep roots in our thinking and behaving. For most of us, it is a part of our essential makeup, and we would need to take it into account as it’s nigh on impossible to totally eliminate it from our lives. Having an ego is not a massive issue in itself unless we allow it to interfere with our trading strategies and decisions. 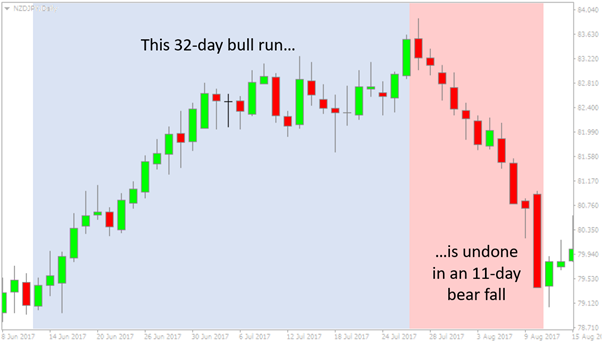 One of the most serious occasions, when we see ego clashing with our trading execution, is when we allow our desire to have made the right decision about a trade that is going against us to overwhelm our own trading rules. We can then easily end up incurring more risk than we initially planned. 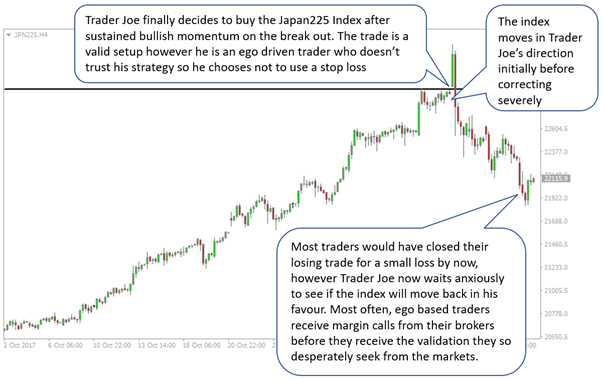 The ego-based trader will attach value to “being right” in a particular trade and start to move their stop-loss down. They convince themselves they are allowing their trade more room to change direction and go the right way. But this is exactly the type of thinking that can wipe out a trading account quicker than pretty much anything else.